NSS is free servicing tool which is used to unlock forgotten security codes on Nokia devices. The software has high power and ability to retrieve original product code and warranty data from an online server. Basically NSS also changes the CSC or the product code through the USB cable connection. Besides, firmwares can be loaded and flashed on the phone. You will need to just download and install latest setup of NSS service on your PC. It can support for servicing several Nokia brands. 2700 Classic , 2730 Classic , 3109c , 3110c , 3120c , 3250 , 3500c , 3600s , 3610 Fold , 3710 Fold , 3720 Classic , 5130 XpressM , 5200 / 5200b , 5220 XpressM , 5230 XpressM , 5300 / 5300b , 5310 / 5310b , 5320 , 5500 , 5530 XpressM , 5610 , 5630 XpressM , 5700 , 5730 XpressM , 5800 , 6085 / 6086 , 6110n , 6120c , 6121c , 6124c , 6125 , 6126 / 6133b , 6131 / 6133 , 6131 (NFC) , 6136 , 6151 , 6208 Classic , 6210n , 6212c , 6220c , 6233 , 6234 , 6260 Slide , 6263 , 6267 , 6270 , 6280 / 6288 , 6282 , 6290 , 6300 , 6300i , 6301 , 6303 Classic , 6500 Classic , 6500 Slide , 6555 , 6600 Fold , 6600 Slide , 6630 , 6650 Fold , 6680 , 6681 , 6682 , 6700 Classic , 6710 Navigator , 6720 Classic , 6730 Classic , 6760 Slide , 6790 Surge , 7210c , 7310c , 7370 , 7373 , 7390 , 7500 , 7510c , 7610c , 7900 , 8600 , 8800 arte , E50 , E51 , E52 , E55 , E60 , E61 , E61i , E62 , E63 , E65 , E66 , E70 , E71 , E72 , E75 , E90 , N70 , N71 , N72 , N73 , N75 , N76 , N77 , N78 , N79 , N80 , N81 , N82 , N85 , N86 , N90 , N91 , N92 , N93 , N93i , N95 , N95 8GB , N96 , N97 and much more. It is free and easy to use. 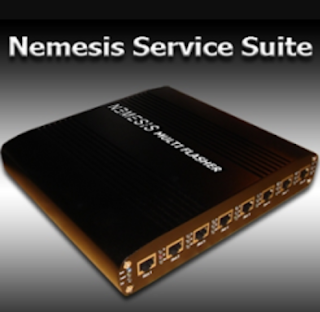 Its latest version can support for all our current hardware devices Nemesis Multiflasher Box, F1 device and Prodigy LPT device. It can also interface with Diamond for secure execution of additional applications. The most usefull function is probably the VUD mode (Virtual USB Device) where it can directly comunicate with any BB5 phone via DKU-2 USB cable. We are still providing free download of the latest Beta versions of NSS. You can download latest setup of NSS from below links.